Club Penguin Cheats by Mimo777 Club Penguin Cheats by Mimo777: New Play Secrets of the Bamboo Forest Cheats! Sweet! Check out the new play, Secrets of the Bamboo Forest at the Stage! When you get the Feather Pin that is at the Beacon, the Golden Feather will glow. A wooden bridge will appear and you will be able to cross the river. 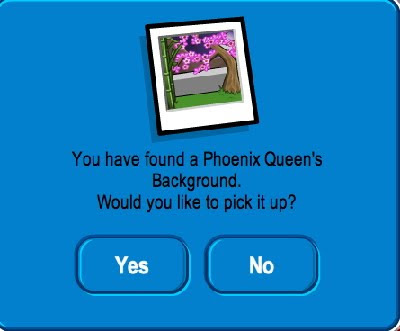 You will then get the new Phoenix Queen's background! Cool! Wha? No cheats in the Stage Catalog? Wassup wit dat? Oh yeah, don't forget to look around the island. There are boxes with party supplies for the Puffle Party next week! They have even drained the pool so the black puffle will be able to skateboard again! Hey MIMO! did ya know that if you were the dog costume and wave you turn into a statue? kool huh! If you put on a full outfit of the guard dog (from the stage) and wave, you turn into stone. Mimo if u sit while whereing the dog gaurd suit u turn to stone. I will check back tomorrow to see the septilions or comments which say"Im you wear the full costume of the guardian dog then wave you will turn to a statue"
If mimo will read all of those septilions comments he shal wear glasses after! mimo you are awesome! thx so much for showing us this. the stage is awesome. i love doing it. Yeah, not a real big fan of the play either, but I'm wondering where the red puffle's room is this year? it's not at the cove and I'm not sure why. mimo at the ice rink one side of the bleachers is missing!